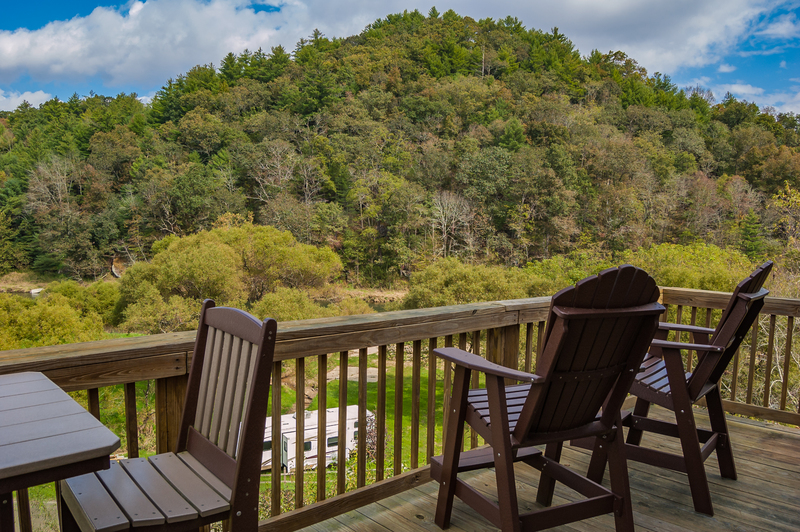 You'll love the river view from the deck of this stunning cabin! 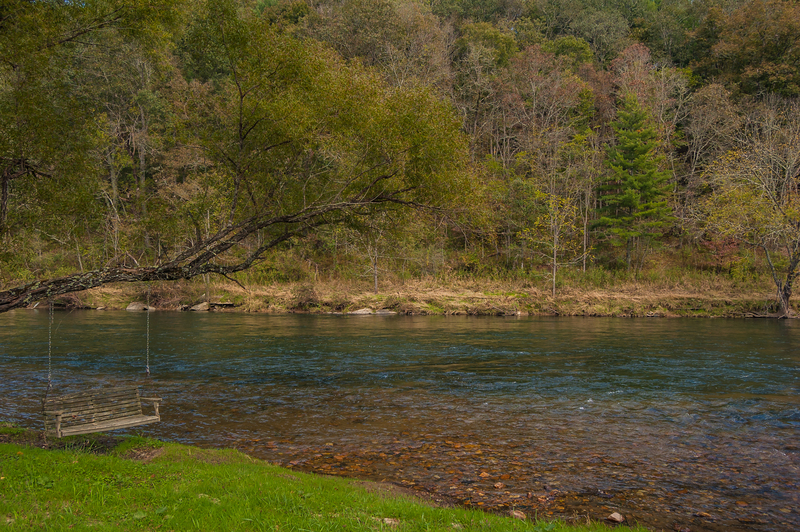 The New River is one of the High Country's primary attractions, and Peace Cabin is an ideal location for enjoying all the river activities, as well as the magnificent river view. 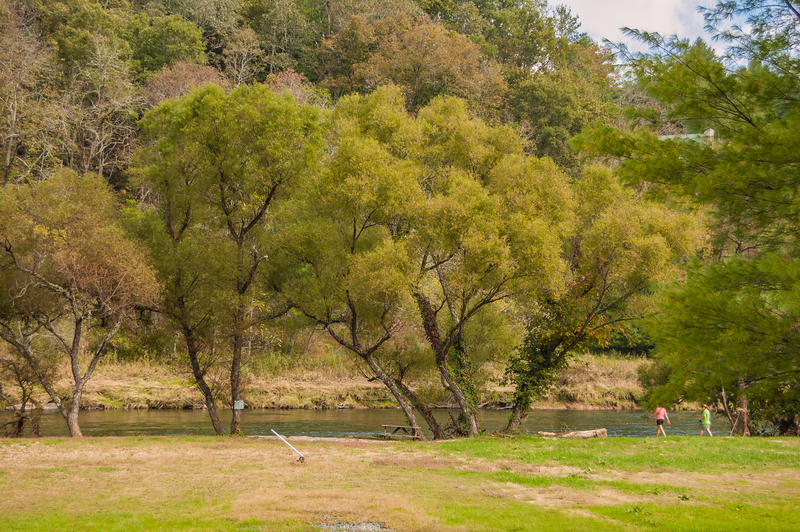 Bring your fishing pole and good luck, since the New River is directly across the street from your vacation haven. You can also spend the day on a kayak, canoe or inner tube, or simply paddle around and enjoy the ambiance. The river is shallow and slow-moving - safe and enjoyable for all ages. Don't worry if you don't have the gear - Riverside Canoeing is only half a mile away. 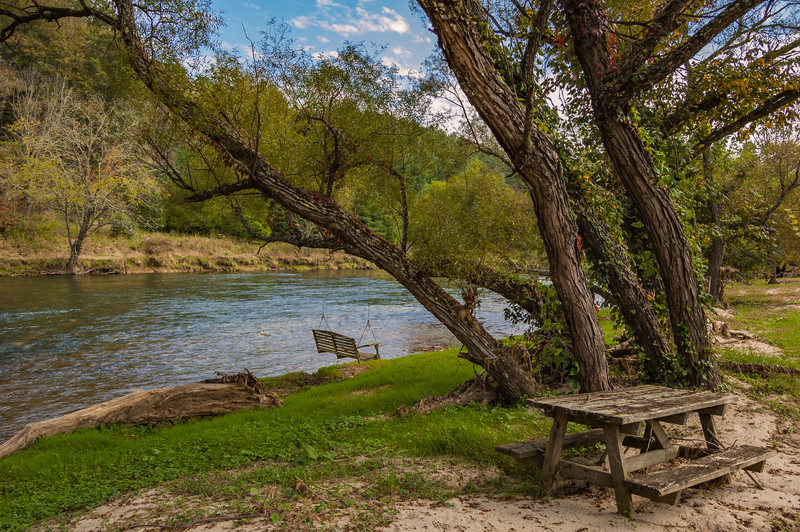 Just walk across the street and you'll find Peace Cabin's river access picnic area - a perfect spot for spending a relaxing day with friends and family. 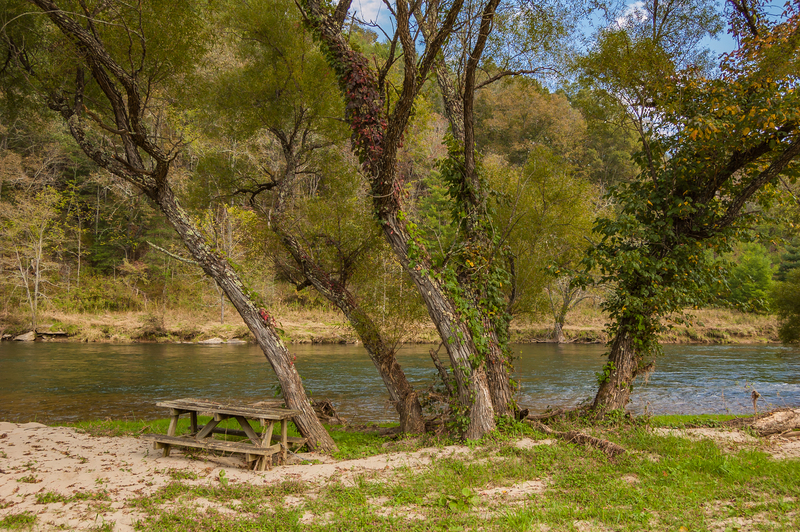 There's a wide stretch of river frontage, as well as a picnic table and a romantic porch swing, all on flat, open ground directly along the river's edge. 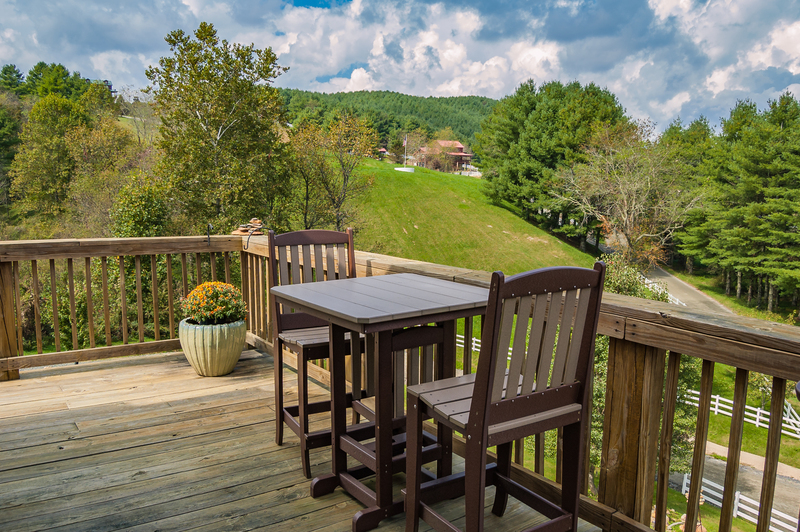 Or you can enjoy a similar ambiance on your wide wrap-around deck, perched above the river. Either way, plan to spend lots of time outdoors, and perhaps end the day with marshmallows by the fire pit, with a billion stars above. 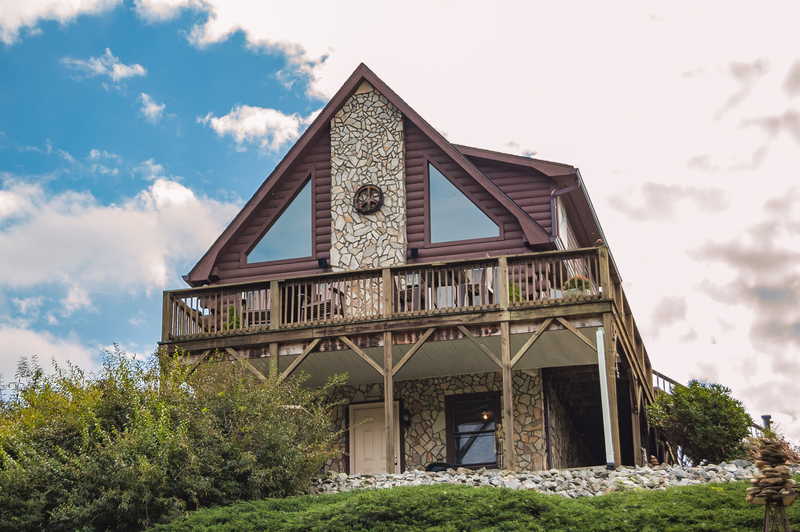 Once you tear yourself away from the scenery and come inside, you'll find a charming, well-appointed home environment, with a true cabin ambiance. 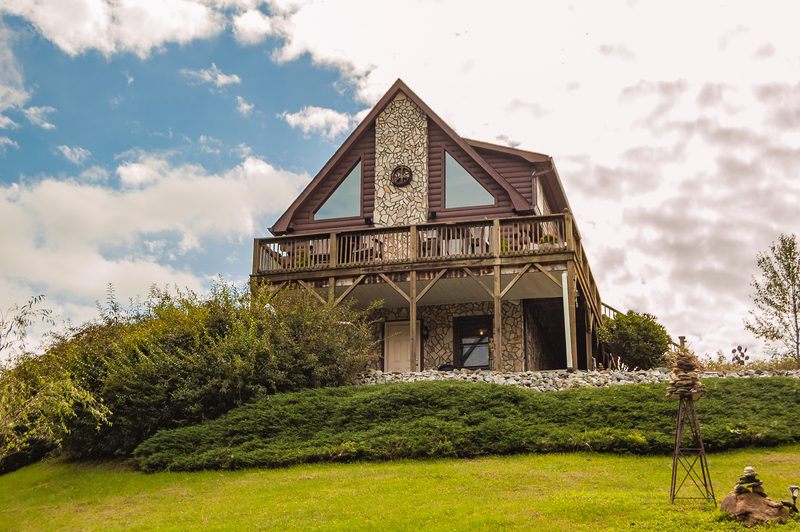 The main level features an open floorplan, with a large living room, a huge stone fireplace, a big flatscreen TV and lots of windows, inviting the view inside. 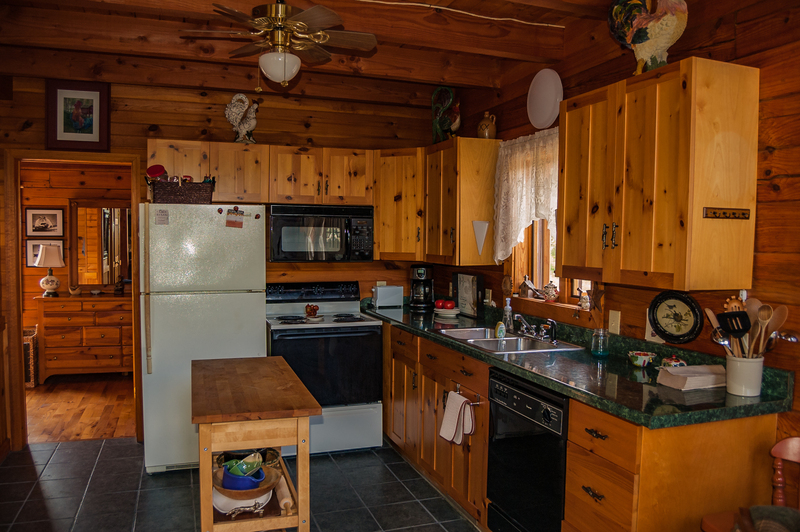 The kitchen is equipped with everything you'll need for meals and entertainment, including a dishwasher, microwave, coffee maker and full set of dining accessories. 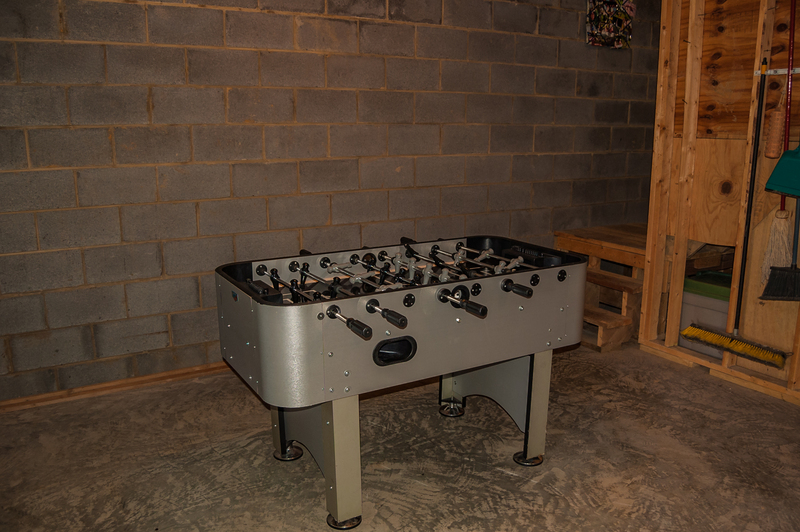 This is another perfect spot for your group to gather, relaxing in front of the fire, playing games or watching TV. The home also offers free wi-fi. The master suite gives you a king-sized bed, so you can stretch out and get a great night's sleep after your full day of vacationing. Upstairs you'll find two additional bedrooms, each with queen-sized beds. These bedrooms share a full bath with a tub-shower combination. 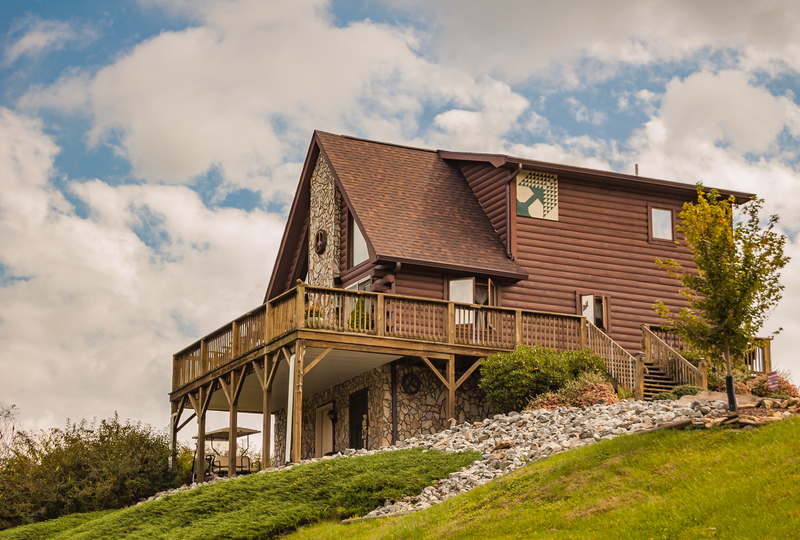 Peace, comfort, magnificent scenery and direct access to the New River - this is what you come to High Country for! 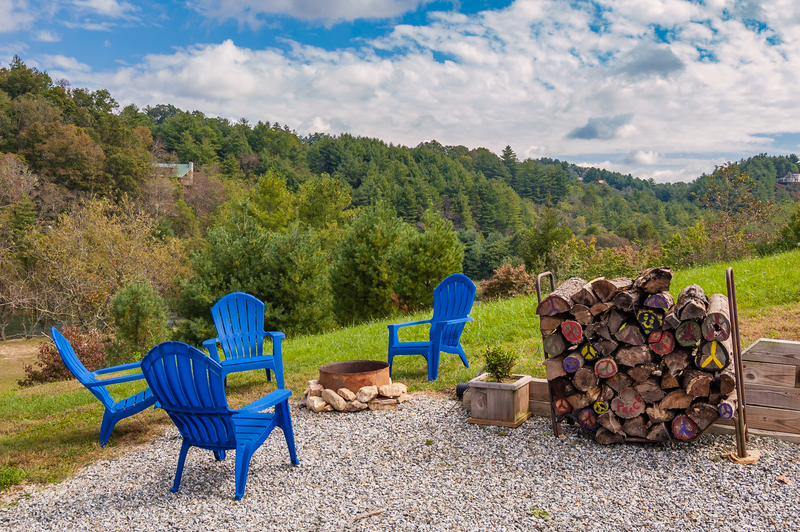 Peace Cabin is in the northern part of Ashe County, only 5 minutes from the world famous Shatley Springs restaurant or the New River State Park. Grayson Highlands State Park is also only 30 minutes away. There you can see wild ponies and more majestic mountain views. Less than an hour from Mountain Peace is the Virginia Creeper - North Carolina and Virginia's premier mountain biking trail, which stretches 34 miles from Abingdon, down through the lovely town of Damascus, along the Whitetop Laurel River and up to its highest point at Whitetop Station, near the NC state line. 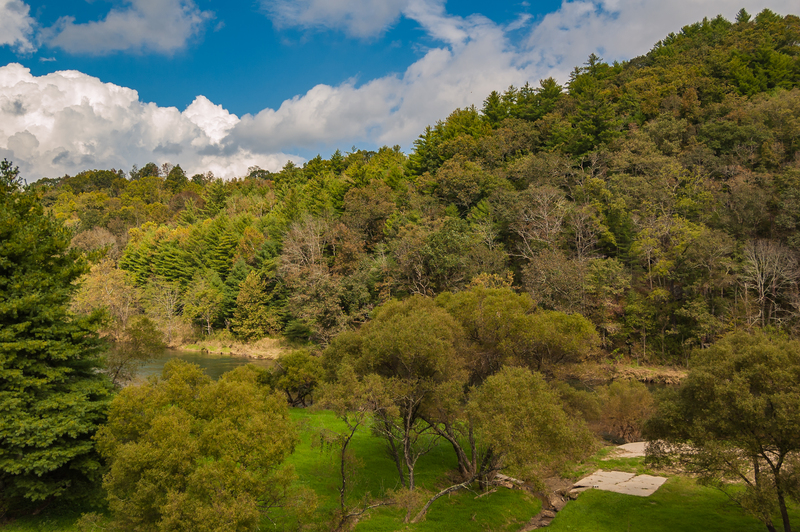 This trail is open year round to hiking, mountain biking and horseback riding. Don't miss this ride - a blast for the whole family, with several bike rental shops to serve you.